Microwaves might spark, perform poorly, or fail to operate. In any case, we are here to help. Contact our company if you are in need of microwave repair in Long B each, California. Let our kitchen appliance specialists handle any microwave related problem. After years of servicing microwaves, we have the experience to deal with even the most complex problems. Whether your appliance is an old or new model, we can fix it. Get in touch with Appliance Repair Long Beach for affordable and prompt services. What’s wrong with your microwave? What you experience is only a symptom. What our microwave repair specialists do is find the roots of the problem and thus fix the appliance. Don’t hesitate to call us even if you think that the issue is only a trivial one. Sometimes, it’s not. More often than not, trivial problems become serious ones in no time. And always remember that a malfunctioning microwave is not good news for your safety. It can be easily compromised. 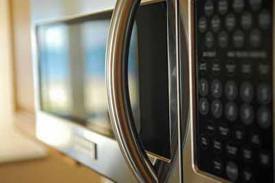 Call us for same day microwave oven repair in Long Beach. We provide local service and help as soon as possible. From conventional counter top microwave models to the new age drawer ones, we can fix any type. We have the experience and skills. All pros keep up to date with new technology and the newest repair techniques. So when we come to service your microwave, we are equipped to fix any model. We have the spares, diagnostic equipment, and all tools needed. What we also offer is preventive microwave service. Our pros can maintain the microwave to prevent problems. We prolong the appliance’s lifespan and handle minor issues to keep them from expanding. You can also call us to install a new microwave. Whichever model you get, we are here to fit it right and hence ensure its good operation. Our techs are trained extensively and qualified. We are insured and certified. You can trust us for any service. We are the trusted team you want for dependable, low priced, and prompt microwave repair Long Beach services. Don’t be reluctant to call us if you need our help.